An Armstrong Aluminum screen enclosure provides great visibility while protecting your environment from flying insects and plant debris. Our screened in patio, porch and lanai enclosures are perfect for enjoying the beauty of the outdoors in a comfortable atmosphere. 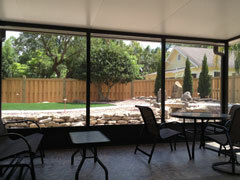 Our screen enclosures are breezy and come variety of colors and screen densities that can provide relief from the harsh Florida sun when necessary. No matter what your screened enclosure needs are Armstrong Aluminum has a solution that fits your budget, lifestyle, personal preferences, and aesthetic. We don’t charge extra for quality ! We offer stainless steel door hardware as well as stainless steel fasteners. 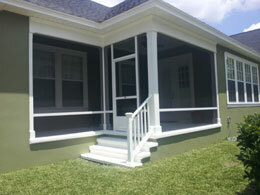 We only use the highest grade aluminum to make your patio, porch or lanai’s structure and roof bracing. It looks better and adds strength at a minimal cost. Also be sure to check out our Roll-Up Screen services. This exciting feature gives you and your family the option of enjoying a comfortable screened in atmosphere or a wide open, free air environment on those sunny Florida days. We service most of the Central Florida region. Click here for our service areas.